Ed Carbonaro and Mike (5-O) the sales manager did a great job in getting me into a car that I wanted. I initially clicked on the their website asking for information about a specific vehicle which put Ed in contact with me. Ed texted me some good information and as I live 2 hours from their dealership, he got me to the point where I drove up there and we put the deal together. I understand that they probably get tons of these on-line requests that lead nowhere, but Ed hung in there. I am not easy to deal with, but in spite of my nature, Ed and Mike were calm, cool and collected and hung in there like true professionals. Ed and Mike were straight shooters, there wasn't a ton of the back and forth stuff and in the end everyone is happy. And the best deals are when both sides are happy. I would also like to mention that the receptionist was very nice and made small talk with me and brought me a bottle of water while I waited for Ed to become available. She had a great attitude and made me feel very comfortable. I also would like to commend Stacy (I believe was here name) who handled all the paperwork in a very professional and timely manner, it was obvious she knew what she was doing. A few of the other salespersons (Tre' maybe?) congratulated me on my purchase and all of that contributed to a more local, hometown feeling experience. 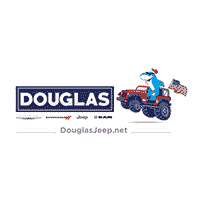 I would highly recommend the Douglass dealership to anyone. Our experience with Douglas was one of the best car purchase we have had. Would recommend t to friends. Just bought a new ram pick up from here. Couldn't be happier with the experience. Tre' vahn was a superb salesman!! Great service department. Wonderful waiting area. From the moment i called to make the appointment to getting my car back from service, i had nothing but courteous and prompt service.